Join in the fun at the Dig It! 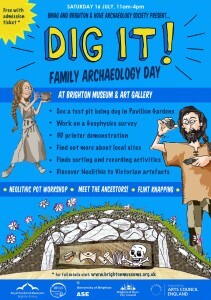 Family Archaeology Day at Brighton Museum on Saturday 16 July. Come along and meet archaeologists and discover ancient (and sometimes mysterious) artefacts from sites across Brighton & Hove, ranging from the Neolithic to the Victorian age. The day will feature special displays, craft activities, demonstrations and talks by experts to take you back through time and make the day an unforgettable experience. Free with admission, members and residents free, drop-in. This entry was posted in Archaeology, Life at Brighton, News, Uncategorized.